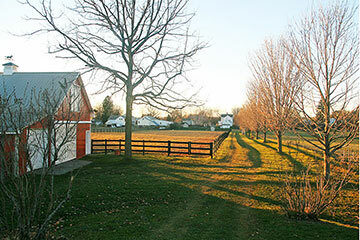 Hatfield founded in 1670, is rich in agricultural history. Located on the banks of the Connecticut River, it's a small, rural town that prides itself on its close-knit community, with a total of about 3,300 residents. Hatfield's sweeping Main Street retains a remarkable historic character, with many very well preserved 18th and 19th-century homes. The town has two public schools: The Hatfield Elementary School and Smith Academy (grades 7-12). With just about 190 students, Smith Academy is the smallest public school in the state. Scroll down to discover the latest real estate for sale in Harfield, MA. Look through scenic homes with acres, ready-to-build land, and many other listings to find your new property. Found something you love? Save it when you create an account, and you can get email updates when new properties match your search criteria. Contact us for more information and to schedule a showing. Move right in to this very well maintained 2-bedroom ranch in a sweet Hatfield spot! Lots of improvements and updates including 5-year-old Buderus heating system and water heater, young roof, fresh paint, and new bathroom and kitchen floors. Enjoy the privacy that comes from being at the end of the street as you sit on your back deck. Come see for yourself at the open house Saturday April 6 from 11-1. Great opportunity in this beautifully maintained Gambrel style home complete with a detached 4 bay garage in North Hatfield. Set on an acre, convenient to major routes, and with the added bonus of being zoned business, this property provides space and potential. The first floor has a bright, remodeled eat-in kitchen, dining room and living room with hardwood floors, and a bedroom/office. There is an enclosed porch on the front of the house, as well as on the back, perfect for relaxing this spring and summer. The second floor has the full bath, and two large bedrooms. The basement is dry and spotless, with plenty of storage, a work area, and laundry. Updated oil burner and oil tank in 2015. The spacious lot is perfect for gardens and entertaining. The garage is huge and one of the four bays is oversized. New septic installed in 2012. This home has been well-loved for the past 45 years and is ready to welcome new owners!